This wicked knife creation is part self-defense, part karambit, and part cleaver. More than just an aggressive knife design, this piece has the materials and construction methods to back it up. That is to say, this piece has the bite to go along with its bark! Forged from one full tang piece of 3.5mm thick steel, this knife measures 12 in. overall with a 6 1/4 in. edge. 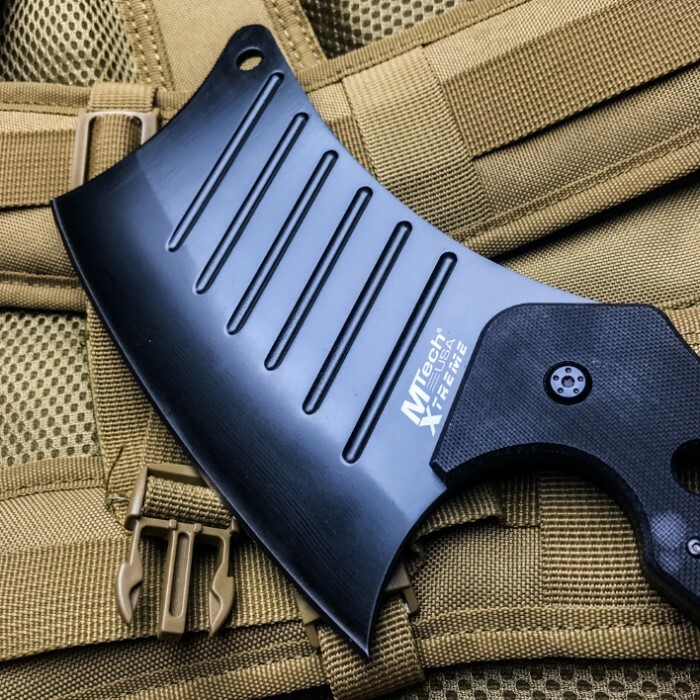 The blade offers the slicing and chopping power that cleaver knives are renowned for. Six slanted blood grooves line the sides of the blade. Pair the blade with a karambit handle with ring, and you've got a tactical knife that can be wielded a number of different ways. 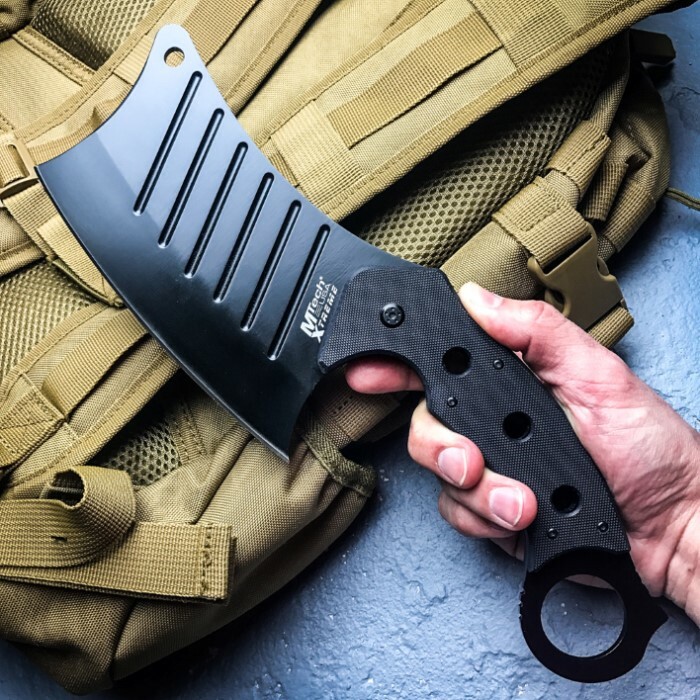 This piece can be held facing upward or downward, just as with traditional karambit knives, depending on the user's preferences. Add two Karambit Kleaver knives to your collection for a dual wield experience unlike any other. Each side of the 5 1/2 in. 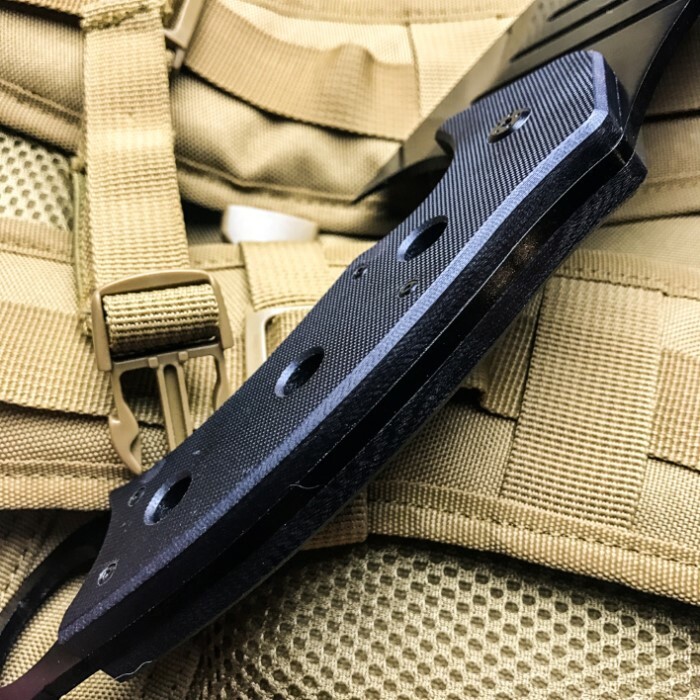 handle is lined with genuine G10 scales for a grip that won't let you down. The handle ring includes a spike and thumb grip (jimping), and there are lashing holes through the handle and top of the blade. Includes black nylon sheath with snap closure and belt loop. Measurements: 12 in. overall, 6 1/4 in. blade. The knife feels great in a hand and is capable of whatever you need it for. I bought this karambit style cleaver out of curiosity. Then I saw a survivalist using a similar style blade. He said it was better than a machete because of compactness, It would chop larger logs. He felt it was better than most hatchets for compactness and edge retention. It's also handy enough for smaller jobs like shaving off bark and shaving fire kindling I've found this one can and did have a razors edge and that karambit point is also a helpful addition. The only reason I gave it 4 stars instead of five is because the karambit style ring has squared off edges which makes it quite uncomfortable while performing some jobs. I filed it down, rounding all the sharp handle parts, making it quite comfortable to use. It seems to hold a decent edge but I like things very sharp and I like to sharpen them so I don't give it much of a chance to get dull. If your handy and don't mind making a knife or tool work better for you. And your a bit of a survivalist at heart. I think you'll be surprised and happy with this tough little tool in your survival gear lineup. Especially for the price. A little work, a little ingenuity and you'll have a very useful tool that could very easily save your bacon in very bad situation! 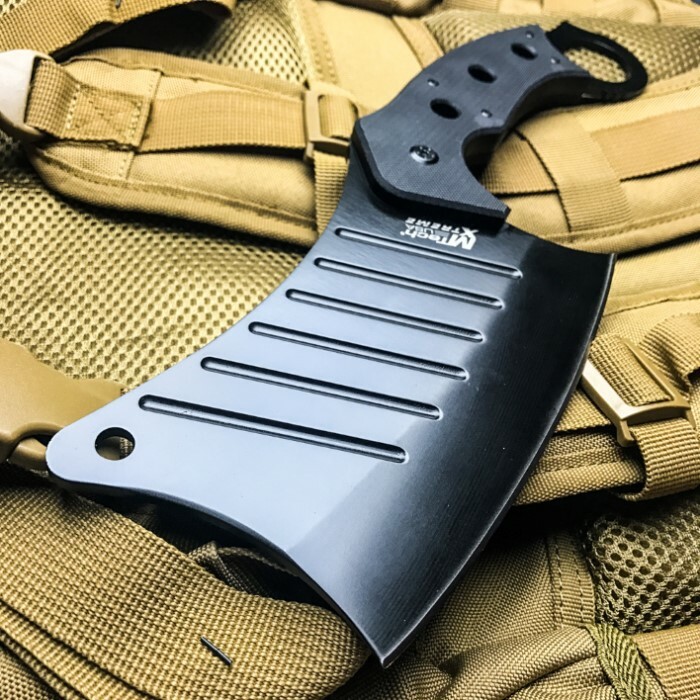 this cleaver looks mean just from the picture and it feels meaner in your hand i know im going to order a second one to go with the first true swords has exceeded my expectations again and i definitely recommend this knife to anyone else for a collection a bug out kit or a blade enthusiast the one thing im wondering is can it be thrown??? this thing is BIG. i have large hands and i still cant comfortable hold and swing it while using the ring on the end of the handle. it is made well and sharp out of the box. it is a great addition to my collection and the size is intimidating. the sheath is made very well and has a small pouch for storing a sharping stone (my guess). great quality and shipped on time, only wish i had larger hands to wield it like it was meant to be.